Episode 3 of Season 8 of Afterlife TV (if you missed episodes 1 or 2, watch them first): I think this the best episode of the first 3 episodes. Here I discuss 5 key factors that determine how and when we die. Ever wonder how it is that a soul chooses when to leave the planet — when to return home to the spirit world? Here are the 5 main factors that our soul uses to make that choice. I end this episode with a very special clip from one of my interviews with someone who had a near-death experience. I chose this highlight clip because it speaks to how important we each are as spiritual beings inhabiting this world. Said another way, this speaks to how important YOU are to this world. I can’t think of a more important message to give you right now. So have fun listening (or watching), and I look forward to your comments. 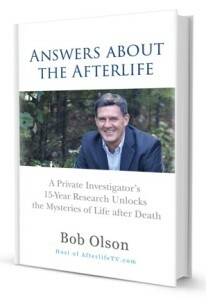 Bob: Hey everybody, Bob Olson here with Afterlife TV. You can find us at afterlifetv.com. This is where we talk about life after death and answer the meaningful questions you have around that subject. Wow, this is the third version of the three episodes that I promised you to just to kick us off for season eight of Afterlife TV. I’m pretty excited about it. 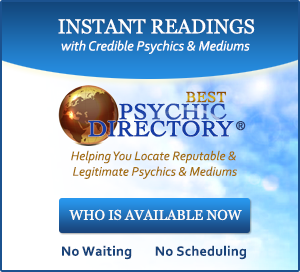 I wanna thank our sponsor, Best Psychic Directory which you can find the bestpsychicdirectory.com. A lot of people ask me, you know, what is the connection? 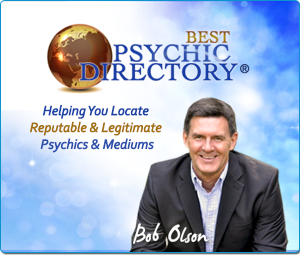 We have the sponsor, Best Psychic Directory, it’s my site. We have over 900 psychics and mediums there. What’s the connection between that and the afterlife? And of course, when my father died in 1997, I was a private investigator. And I decided, because I had so many questions about life after death, following his passing, that I wanted to use my skills as a private eye to investigate the afterlife. I spent two years going to psychics, and astrologers, and tarot readers. You know, I really didn’t know where to go, because I had been a skeptic so long. Finally, about two years later, I ended up having readings with mediums. And this was in 1999. And this is the first time I felt like I really had evidence of life after death. I had strangers, these mediums who are strangers to me, telling me things about my deceased loved ones, now in spirit, that they couldn’t possibly know. Telling me about memories that I had with those people in spirit that they couldn’t possibly know, and so much more. So this was the beginning of me feeling like I really had evidence. So, my investigation started in 1997. I often say it didn’t begin until 1999, because that’s when I found my first evidence. The reality is, any investigation begins in such a way that you often don’t find concrete evidence right away. And in my case, it took two years before I did. I ended up, then, having more and more readings with mediums because I wanted to see what it was like to have a reading from a different person, and then another different person, then another different person. 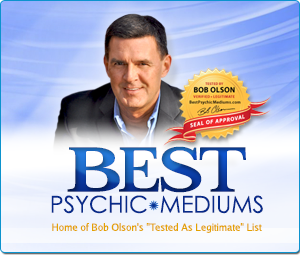 And before I knew it, I had tested, basically, hundreds of psychics and mediums. Now, when I say tested, I was testing them from my research. I was comparing and contrasting and analyzing these readings that I was getting. And lo and behold, without intending to do it, I realized that I, sort of, became an expert on psychics and mediums because by having all these readings and analyzing them in the way that I was analyzing them, I now recognized when someone needed more training or more experience or where it was that they were lacking and why and the mistakes that they were making that, with a simple change, could make them a better reader. And before I knew it, I was teaching psychics and mediums. In 2010, I taught 122 psychics and mediums from around this country and parts of Canada. And I taught them the 21 top criteria for giving better readings. 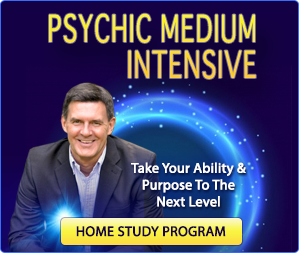 And psychics and mediums are still learning from that because they can buy the audio on psychicmediumworkshop.com. So that’s how Best Psychic Directory comes into play. And that’s why they’re our sponsor because it’s so important to me. I think getting readings from mediums and even getting readings from psychics, which is a very different experience and for a different reason. But I think they’re both extremely important experiences to have, so I’m very passionate about it and a great advocate of them. So, check out bestpsychicdirectory.com. All right, I’m gonna welcome you back because I think I saved the best for last here out of the three episodes. Pretty excited about this one. Today, we’re gonna be talking about how and when we die, what determines when we die? It’s a big question. It’s a question that I certainly wondered about before I started investigating the afterlife, and I know a lot of people think about these things. Well, I list five criteria here. And I repeat several times that these are not the only criteria. There’s really an infinite number of criteria that determines how and when we die, but these are certainly key criteria. And you will understand when you hear what you’re about to hear why that is. And it also helps you understand what maybe some of the other criteria are. So we’re gonna start with that. And then, I have something special to share with you after that that I think is, sort of, a tie in to that, sort of, a little way of wrapping this up with a bow and leaving you with something to think about and something to feel good about. So what you’re gonna be hearing is a clip from the book I wrote, “Answers About the Afterlife.” We now have the audiobook version available, and this is a clip from that audio version on the question, how and when we die? Alan: What determines how and when we die? Throughout this book, keep in mind that my using the word “die” has a slightly different meaning than how most people use it. Dying, when I use the word, only means that our physical body dies, not our consciousness. In reality, we go on living without our body. Consciousness survives death. So when I use the word “die” or “dying” in this book, I’m simply referring to the death of the physical body. When this occurs, our spirit, consciousness, returns to the spirit world, the afterlife. There are many factors that determine how and when we die. I’ll explain five of the key factors here, but keep in mind that there are an infinite number of factors. It’s important to know too that while one or two factors might be the most influential, it’s really an intricate combination and balance of them all that leads to the ultimate deciding factor. Pre-birth choices. The first factor consists of our pre-birth choices regarding what we came into this lifetime to accomplish. Picture yourself as a soul in the spirit world before you were born getting together with your spirit guides to help pre-plan your trip to the physical plane, this human life. You and your guides decide that there are particular experiences you want to have, meaning you want to gain certain lessons and insights that can only be obtained by having a human life. Well, once you have completed what you came to experience in your lifetime, it’s eventually going to be time for you to leave this life and go back home to the spirit world. But this is just one factor of many. Life enjoyment. Having said what I did about pre-birth choices, many souls choose to hang around and enjoy life for a while once they’ve accomplished what they desire to experience in this lifetime. As we know, all work and no play makes Jack a dull boy. So, it’s not like everyone instantly dies the moment they finish what they came here to do. While, some souls will choose to leave quickly, some souls like to exit life slowly and gradually. What we might think of is dying of old age. And of course, we always continue to learn and grow from a spiritual perspective even if we have already completed the major experiences we hope to know in our lifetime. Assisting others. Some souls choose to remain on the physical plane in order to help other souls accomplish what they set out to experience during their lifetimes. It’s not all about us, although we do gain from helping others. No other soul needs us in order to accomplish what they set out to experience here. There are multiple opportunities for them to accomplish their own goals. But if we can be helpful, we might choose to stick around for the benefit of another. Opportunity. Another factor that determines how and when we die is opportunity. If we take into account that our spirit guides, including our soul self, otherwise known as our higher self, are forever creating miracles and coincidences for our benefit. It helps to understand that an opportunity might arrive for us to exit the planet, that is, if we’ve completed what we came here to do, or know that we will not be able to complete what we came here to do. Say, for example, that the potential for a car accident crosses our path. In this case, our spirit guides and soul determine if this is the best moment for us to exit our human life. If it is, the accident happens and our life is over. If it’s not, we might not get in the accident at all, or we might be involved in the accident but are not killed in it, possibly not even injured. While there are infinite factors that determine the time, place, and circumstances of one’s death, opportunity is an important factor. Yet, opportunity can be affected by one’s free will, the next factor described below. Free will. One of the most important factors that determine how and when we die is free will. Most people have no idea just how powerful our free will is. I have a friend whose mother was dying in her home on New Year’s Eve. The 90-year-old woman’s organs were shutting down, and everyone knew death was imminent. In accordance with her personality, hours before midnight, the dying woman asked her husband if it was more advantageous for their tax return if she died on December 31 or January 1. He looked it up online and found that it was better if she passed after the new year had begun. Sure enough, the dying woman clung to life and took her last breath at 12:10 am. So, free will plays a critical role in how and when we die. If, for instance, a person purposely takes their own life, it was free will that ended that life. If a person suddenly takes a left turn instead of going straight as planned, that free will choice might avoid the fatal accident. If a person chooses to treat their illness alternatively, by eating raw foods, practicing self-love, and spending more time with loved ones and less time working, that person might heal the illness that was going to end their life. Why? That person’s soul might recognize a valuable experiences in the works that the soul would benefit from experiencing. Our pre-birth choices, life enjoyment, assisting others, opportunity, and free will are just some of the significant factors that determine how and when we die. But there are an infinite number of factors at stake. Since our deaths also affect many other people, people who love and depend upon us or people we don’t know who might be affected in some way by our deaths, there’s a lot going on behind the scenes regarding the decision to end our life, infinite factors that must be taken into account. Since our spirit guides and soul self can understand all these infinite factors much better than we can, these factors are all taken into account and factored into the final determination of how and when we die. Bob: All right, that was Alan Adelberg reading from “Answers About the Afterlife.” I absolutely love that particular question and answer that I wrote because I think it teaches us a lot about who we are and why we’re here. Obviously, the question is about how and when we die, what determines how and when we die. But what we get from that is what amazing beings we are. Complicated, right? We think about all the reasons that are factored in when our death point is determined by whoever makes that choice, probably our soul, certainly our spirit guides, and the universe source, creative intelligence, God. Think about pre-birth choices. This is just why we came here. Why did we come here? What did we come to accomplish or learn or experience? I think those latter two are just more important, what did we come to experience and learn. But even more so, when you talk about life enjoyment and assisting others, those two teach us that life is not just about learning and experiencing, there’s other things involved. We’re pretty complicated beings, and pretty special when you think about it. Early in my Afterlife TV journey, when I was interviewing people, and I was interviewing a lot of people who had had near death experiences, one of my favorite interviews, which I think I ended up interviewing her a total of four times, three particularly, about her near death experience. This was with Natalie Sudman. And boy, these were special interviews. And if you haven’t watched them, you certainly should. But I’m gonna play a clip from one of those interviews that I think speaks to what I’m talking about here. And it’s, sort of, the secondary thing that I gained from listening to Alan read this part that I wrote in answers about the afterlife. And I wanna leave you with it because I want you to contemplate what a special human being you are, and that there are important reasons why you’re here. And that you’re much more important, not only to this world and the people all around you, but you’re important to spiritual beings on the other side. And we certainly gained that from Natalie Sudman’s near death experience and the way that she described it to us. This is just a highlight. Now, this is early Afterlife TV and the quality of audio and even video was lacking at that time in 2011. It doesn’t seem like it’s that long ago, but eight years ago. We’ve come a long way, and this was being done through Skype, had some real issues with the audio or video jamming up. And you’ll hear at one point or kind of Natalie’s audio slows down. But, you know, overlook the quality issues that existed at that time and really listen to the contents of what Natalie is teaching us here, and then just go on your day with that. And so here is that highlight clip from one of those interviews. I think you’ll enjoy it. But the one thing that you did learn or at least recognize, thanks to this gathering of thousands of beings, was how important your work here really was, right? Natalie: Well, not just mine, everybody’s. Bob: Okay, expand on that. Natalie: Well, a lot of times, we think that our lives are small and petty and are not very valuable. You know, I’m not as valuable as the person who has control over millions of dollars, or I’m not as valuable as the person who runs a country or…but it’s not true. All of our lives are valuable enough. If you do nothing more than enjoy your day, then, you have done something valuable for creation, for the all that is God, whatever you want to call it. Just our being here is amazing, and everything we do matters, everything has value. Bob: You do touch upon that a little bit about how amazing it is for us to have this human experience because of the skills required, the whatever it takes to require to be able to do that. You get a lot of admiration for that alone, correct? Natalie: Right, yeah. We don’t really realize how amazing and totally cool we are that we can, as spirit, maintain the focus that it takes to stay in our physical bodies and work in a physical environment. It takes a special kind of skill and not all spirits or beings have or whole beings or whatever have developed themselves in that direction. That kind of razor focus that it takes us to stay here is a real, it’s a real high, it’s a real thrill for the whole self to be able to do that. Bob: I hope you enjoyed that as much as I did. That was a little highlight I heard and listening to some of the past episodes and I thought, “Wow, this is really special.” When I was going to do this episode on what determines how and when we die and I heard those five criteria of pre-birth choices, and life enjoyment, assisting others, and I realized, “Wow, we are such special beings.” And it reminded me of that clip that I had, sort of, put aside for a moment like this. And I thought, “Wow, I’m gonna share that with everybody. This is the perfect time to do it.” And I thought it was special. I had this experience recently where we were dealing with something that had to do with our home, something that I wasn’t very educated on. In fact, I knew nothing about it. And so, I had to reach out to people to ask questions and try to learn, not only about the subject, but to learn what it was that I needed in order to do what I needed to do. And I’m just trying to not to get into the details of it. I called people randomly, perfect strangers, and I was blown away by how helpful people were, how generous they were with their time and their information. I can’t tell you how many people spent a half an hour with me on the phone when they had nothing to gain from it. They didn’t know me. I just simply called them on the phone to see if I could get a few answers from them. I really expected five minutes. The people I ran into just…it’s almost like they sat down in a chair and said, “I’m gonna help out this guy.” And I don’t know why they did that, but it really made me feel good about humanity. I guess that’s what I’m trying to say here. And I eventually learned everything I needed to learn about a subject of which I never thought I would ever catch or learn about, and it was all thanks to the generosity of others. Geez, I mean, we’re talking like 10 people. And I just thought, “Okay.” Sometimes I watch the news and I think, “The state of the world is pretty messed up right now.” And then, something like this happens and I go, “Huh. No, no, people are amazing. People are loving. People care about one another.” I hope that’s your experience. And if it’s not, give it a chance. Put yourself out there and see if you can attract that into your life. So I say this in gratitude to those people. I also say it because I’m feeling good about the world as a result of these people. And because of the way this show has gone, I just thought I would share that with you. I hope you enjoyed these three episodes. Pretty different episodes, each of the 3 for the new season, season 8 of Afterlife TV, here we are in 2018. Thanks for joining us. I hope that you will have a wonderful week, and you can join us again next week when we have another new episode for you. My best wishes to you. Male: That’s all for another fantastic Afterlife TV episode. Bob couldn’t be happier. If you enjoyed this episode as much as Bob, please leave a comment on afterlifetv.com, Facebook, Twitter, or YouTube. 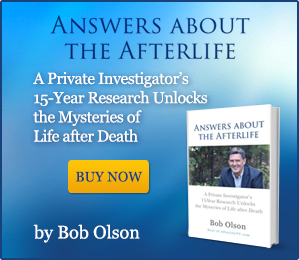 And don’t forget to check out Bob’s book, “Answers About the Afterlife.” Thanks for watching Afterlife TV.